Installing a socket LGA1155 Intel Core i3/i5/i7 processor into a motherboard isn't super tricky task, unless of course you've never done anything like this before... in that case it can be a little intimidating. In the last couple weeks PCSTATS has received a few questions from readers who aren't entirely sure how to install their new CPU into a fresh motherboard, or upgrade an older socket LGA1155 processor with a faster chip. At PCSTATS we've built hundreds of computer systems while testing different motherboards and CPUs, but haven't ever documented the steps. So, here we go! 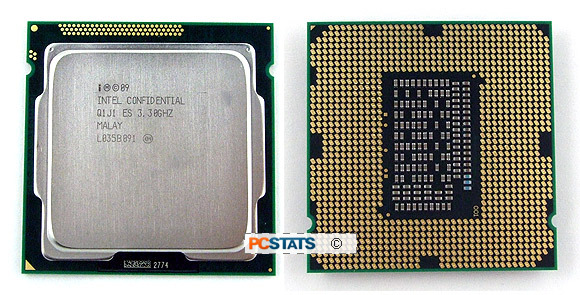 In this straight forward Beginners Guide PCSTATS will show you all the steps to installing and removing a socket LGA1155 Intel Core i3/i5/i7 processor and heatsink. If you're planning computer build some time soon, bookmark this guide for future reference. A word of caution before we begin; there are two components detailed in this article that you should never touch with your fingers: The first component is the gold interface pads on the bottom of the processor. The second is the extremely delicate gold pins in the LGA1155 socket on the motherboard. On the bottom of socket LGA1155 Intel processors you'll find one thousand, one hundred and fifty-five small gold pads and a small patch of microscopic electrical components. The gold pads make contact with corresponding electrical contacts in the processor socket on the motherboard. As you might have guessed, socket LGA1155 processors are only compatible with motherboards built with an LGA1155 socket. Intel warns that the oils on your skin can damage the electrical contacts on the base of the CPU, so only handle the chip by its edges. Pictured above is the correct way to hold a socket LGA1155 processor, or any CPU for that matter. Grasp the chip carefully by the edges of the green PCB substrate and keep your fingers away from the gold pads. This way of holding a CPU will also limit accidents from static electricity. In general, it's best to leave the black plastic protective chip carrier on the bottom of the CPU until you're ready to install the CPU into the motherboard. CPU heatsinks come in all different shapes and sizes, for Intel and AMD processors, but what separates them apart is primarily socket compatibility. 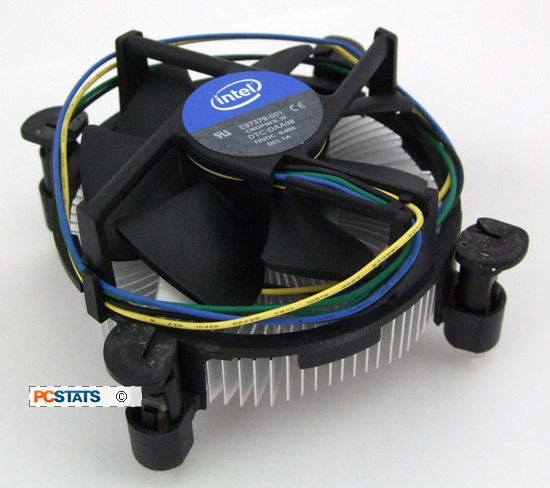 For the purposes of this Beginners Guide, PCSTATS will be installing Intel's stock LGA1155 CPU cooler. For 80% of users this heatsink is good enough... if you're a performance user or demand super quiet operation head over to Frostytech for at look at the Top 5 heatsinks they've tested out of +400 thermal solutions. This Intel heatsink comes with thermal compound already applied to the base, so we don't need to worry about that. When installing a heatsink, ensure there is always a small amount of thermal paste between the cooler and CPU. The Land Grid Array processor socket consists of a top metal pressure plate, a small metal lever, an array of tiny gold pins which make electrical contact with the base of the CPU, and a rear metal support plate behind the PCB. The LGA1155 socket is shown below with its protective plastic cover removed so you can see the pins which interface with the CPU. As you can tell by the photo, these tiny gold pins are very delicate. 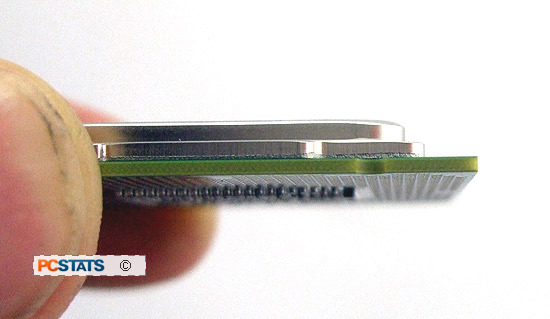 A protective plastic cover sits over these pins when no processor is present, it's considered best practice to only remove the cover just before the CPU is installed. Now that we're familiar with the parts of the CPU socket, let's move on to the step by step process of installing an Intel socket LGA1155 Core i3/i5/i7 processor and heatsink correctly. It's not the hardest thing in the world to do, but it pays to be careful and follow a predetermined set of steps. If you'd like to know how to remove the heatsink and CPU, jump ahead to page 5.